Do note: Accessories shown in the image are for presentation purposes only and length may vary upto 2 inches. (Slight variation in actual color vs. image is possible). In rare scenario, the length of the kameez/bottom and sleeves can be altered, if the design permits. 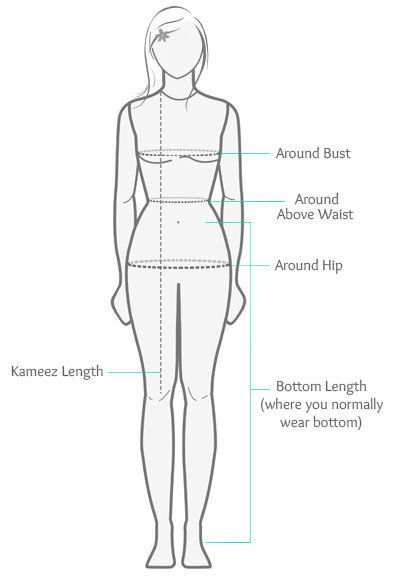 Measure your Garment bust and choose the corresponding size option from the dropdown. The fit, silhouette and length will match the dress shown in the reference photograph. For specific garment dimensions, please refer the Size Chart. In case you prefer Custom Stitching, please utilize our Made to Measure (UDesign) Tailoring Services. Made to Measure (UDesign) is our Bespoke Tailoring Service - you can customize the exact fit of the garment, its styling and add adornments, all to suit your taste and body type. The measurements can be added right away or post ordering at a convenient time from My account. You need to log-in to avail this service. Kameez Length: Measure it from shoulder to over bust and down to as long as you want. Bottom Length: Measure it from the waist (where you normally wear bottom) downwards along the side to the heel. In case of Churidar style we add 10-15 inches/25-38 centimetres (whichever unit is selected) extra to the bottom length.